The Houston Texans apparently aren’t waiting for the NFL regular season end to gauge the crop of prospective coaches. Or perhaps they’re getting a jump on the field to try to lock up their first choice before somebody else snatches him up. According to numerous reports, the Texans interviewed former Bears head coach Lovie Smith this week for their vacant head coaching position. Houston, currently sporting the NFL’s worst record at 2-12 and in the midst of a franchise-worst 12-game losing streak, talked with Smith on Monday, ESPN reported. Houston fired head coach Gary Kubiak on Dec. 6, making him the season’s first coaching casualty. 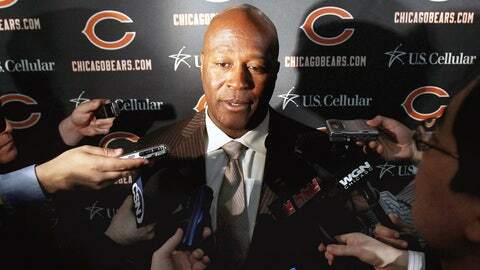 Smith, 55, has spent this season out of the NFL after he was fired by the Bears following a 10-6 record last season. In nine seasons in Chicago, Smith was 81-63 in the regular season, 3-3 in the playoffs. He led the Bears to three NFC North crowns and an appearance in Super Bowl XLI, where his team lost to Peyton Manning and the Colts. The Houston Chronicle reported that, along with the Texas native Smith, the Texans are interested in current Texans interim coach Wade Phillips, Penn State head coach Bill OâBrien and San Diego Chargers offensive coordinator Ken Whisenhunt. The Texans were expected by many to contend for a Super Bowl, but with injuries to â and poor play by â some of their key players, the team rapidly plummeted after a 2-0 start to the season. Kubiak was 61-64 in eight seasons with Houston, his only NFL head coaching job. The Texans won consecutive AFC South titles in the 2011 and 2012 seasons, but lost in the divisional round after beating the Bengals in the wild-card round both seasons.